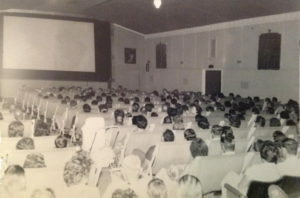 RAY ERENSHAW: Cinema days in NSW – now retired in WA. 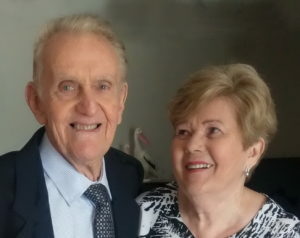 Ray and Irene Erenshaw in 2016. Ray Erenshaw began his 36-year cinema career in 1937 as an 8 year old in his mother’s Strand Theatre in rural Ashford (NSW). Changing day-bills, collecting tickets, ushering, rewinding films and getting them back into their cans, his wages were pocket money to buy lollies from his mothers Strand Café! By the time he was l5, he was operating the Kalee Indomitable projectors. In 1946 at the age of 17, Ray was sent 50 kilometres on boggy, swampy gravel roads in his Model-A Ford, to operate and manage the Regent Theatre in Delungra which his mother had just purchased. In 1951 his mother sold the Regent to Ray who immediately upgraded to a Raymac sound system and C&W projectors. 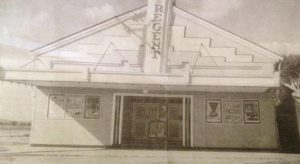 Always wanting to improve the Regent, Ray later purchased all the magnificent equipment from Hoyts Arcadia Theatre in suburban Chatswood (NSW), including Kalee 21 projectors, four-track stereophonic sound system, rectifier, standby 25 kva generator etc. The Delungra Regent was the only theatre north of Newcastle with this type of equipment. Funnily, when this equipment was installed, Ray asked the installers what was the purpose of the box between the two projectors? The reply was “it’s the Jesus Box”. Of course Ray asked: What’s a Jesus Box? During the screening of a biblical film, at the point of Christ’s crucifixion, when the lightning and thunder struck, the stereo sound was so realistic, the farmers amongst the patrons left the theatre to close the windows of their vehicles! (It was safe to leave your vehicles unlocked in those days). Ray prided himself in his advertising displays and showmanship. When he screened “Circus World” he had his teenage daughter Raylee wear the trapeze costume sitting on the back of his ute, as he drove her around town. When he screened “Psycho” he changed all the globes inside and out to an eerie green. For “Around the World in 80 Days” Ray made up mini hot air balloons to hang from every light. Interior of the Regent Theatre, Delungra. NSW. With his great enthusiasm for the industry, Ray later opened The Civic Theatre in Inverell NSW while still continuing to operating his Regent at nearby Delungra. Another of his ventures was as a travelling picture-showman, taking his portable film equipment [which he obtained from a hospital ship after the war] 81 kms to provide films to the community of a small outback town. He also continued to regularly travel to Sydney to book the films to be screened at both his and his mother’s theatres. Throughout all these years and activities, Ray continued to operate his Delungra Regent, in fact, right up to the advent of television in the early 60’s. As happened elsewhere, sadly patronage dropped drastically, down to the stage where it was no longer viable to keep the doors open. Ever hopeful, he would screen the show to an empty house until after half time, when he would switch everything off and go home devastated. The Regent was sold fully equipped in 1969 for $2,000… land, buildings – the lot. The new owner sold the equipment and turned the theatre into a hall for roller-skating and basketball, but the theatre mysteriously burnt down a few years later. It broke Ray’s heart as he had put his heart and soul into his beloved theatre. Ray had always had a keen interest in aeroplanes, making up models as a child and was even successful in competing in National championships. He later took up flying as a hobby and gained his Commercial Licence. 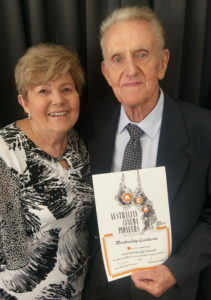 When Ray sold the theatre in 1969, he took up aviation as a career and became a survey pilot for a mining company – looking for Uranium all over Australia for many years. While flying aerial survey was very rewarding, Ray and his family led a nomadic life. Seeking something more stable he and his family moved to Wittenoom (WA) in 1974 where they owned and operated an air charter business and managed a caravan park for 7 years. When the blue asbestos was found to be a problem for the family, the business was sold and the family moved to seaside Kalbarri (WA) at the end of 1980. Here Ray and his family began a very successful aviation business, as well as operating a popular gift shop there for 25yrs until retiring south to Mandurah in 2005. In 2016 Ray was pleased to discover Cinema Pioneers and very honoured to be accepted as a member and have his long contribution to the industry recognised.